A sudden guitar riff slices through the conversations in TDU, snagging the attention of all in attendance. It fades as quickly as it appeared as heads turn, gazes dart, expectant, to the stage, where the lead singer is now testing the mic with some vocal gymnastics. The thunder of drums reverberates for several heartbeats, and the rumble of a bass guitar concludes the sound check. The promise of good music lures a small crowd to the foot of the stage before the drums even kick in on the first song. Thanks to the University Program Board’s (UPB) Spotlight Sounds Committee, this event is just one of the free coffee house-style concerts hosted monthly throughout the semester, collectively termed the Spotlight Series. Including student musicians and local bands, “The Spotlight Sounds Committee works hard to bring up-and-coming bands to TDU every month,” said the committee’s director Marisa Righi, a senior marketing major with a music industry minor. Though this has come to be a musical tradition that many students look forward to, it hasn’t existed for long. In fact, the Spotlight Sounds committee is a relatively new addition to UPB. The committee was originally known as 80 One Records, and used to be one of the few student-run record labels in the United States. JMU alum and Student Organization Services Coordinator Chris Stup formulated the idea for a university sponsored label, which UPB made a reality in 2004. Named after the interstate that divides campus, Marc Choi created the winning name, logo, and design chosen in a contest decided by UPB’s Executive Board. 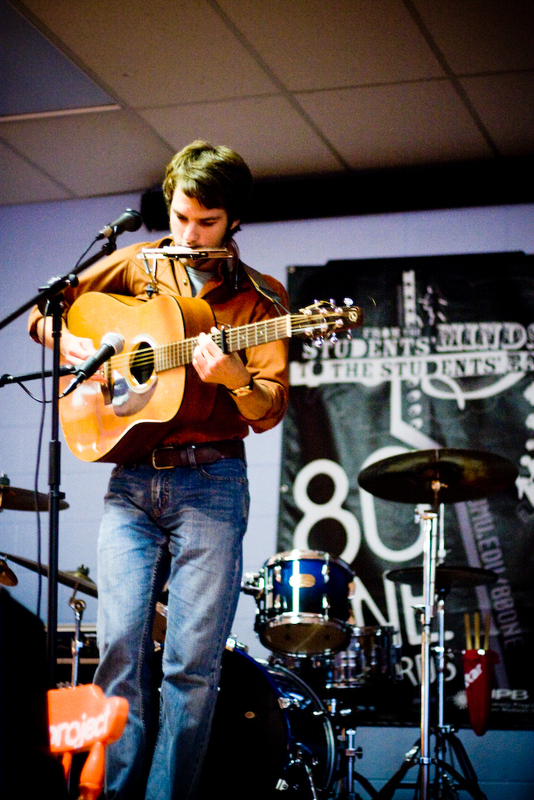 To debut 80 One Records, UPB hosted a free compilation CD release concert on Thursday, April 29, 2004. UPB selected eight diverse artists and bands with ties to JMU to record two tracks each to appear on the compilation CD. The record label took off scouting for student musical talent after that, and in November 2004 released their first CD featuring a single artist, sophomore Nathaniel Baker. Though 80 One Records was run by volunteers, the committee strove to provide all the benefits a professional record label would as they continued to support JMU talent. Keeping that ideal in mind, every artist or band had to be affiliated with JMU, with at least one band member a current student of the university. Upon graduation, the artist or band would own the rights to their own music and their contract with the label would end. In 2008, to further publicize the opportunities the label could provide for student musical artists, 80 One Records hosted a Battle of the Bands, with the winner receiving a record deal and all the other benefits of signing with the label. This included having their music professionally recorded, promoted and distributed, opening for other UPB concerts, and having label representatives booking shows statewide as well as searching for labels to sign with the musicians after graduation. Revenue generated from album sales and concerts both on and off campus funded the committee’s efforts. The next year, Battle of the Bands became Record Deal Rumble, and the winner also had the opportunity to open for the spring concert at the Convocation Center. In the spring of 2010, Record Deal Rumble became Rumble Down Under with the “Rumble Master’s” grand prize becoming an opportunity to headline a show. The change occurred because 80 One Records ceased being a record label in 2010, citing limited resources and an inability to truly give their artists what they needed. Instead, the committee began to focus on providing more shows and events on campus for students. By fall of the same year, 80 One Records fully transitioned to the Spotlight Sounds Committee, repurposed as a booking agency that hosted musical programming featuring both student and local talent, as well as up-and-coming artists. The committee continued with the Rumble Down Under tradition, and even added a new one: the free, monthly Spotlight Series hosted in TDU. Since then, though the format and function of Spotlight Series has evolved, the objective has remained the same: showcase diverse musical artists that students will love. During 2011, the Spotlight Sounds committee instituted a change to the series, deciding to have it occur twice a month, with one act featuring student talent and the other featuring a budding artist or band not affiliated with JMU. Soon after, they merged the two concerts, with the former category providing opening acts and the latter being the headliners. More recently, the committee has added several incentives to attend shows, with free campus cookies becoming a regular, as well as concluding shows with raffles where winners receive free tickets to other UPB events. In the fall of 2015, students were able to win free movie tickets to Grafton, and a meet-and-greet opportunity with the sold-out fall concert headliner, Lil Dicky. The Spotlight Sounds Committee concluded the 2015 fall semester with one final Spotlight Series concert featuring three singer-songwriters who performed and discussed their song-writing experience in between songs, a format used in previous years. Stay tuned (in more ways than one) for the committee’s upcoming events by checking UPB’s website. In the meantime, don’t miss Firefly Festival alum Prinze George’s performance on Wednesday, January 27th to kick off the first Spotlight Series concert of the year.